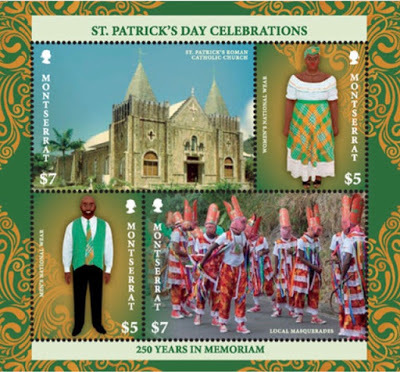 The Montserrat Philatelic Bureau has released a series of stamps called “St Patrick’s Day Celebrations – 250 Years in Memoriam”. Official release date was March 29, 2018. The bureau had delayed announcing the stamps until they were available locally. 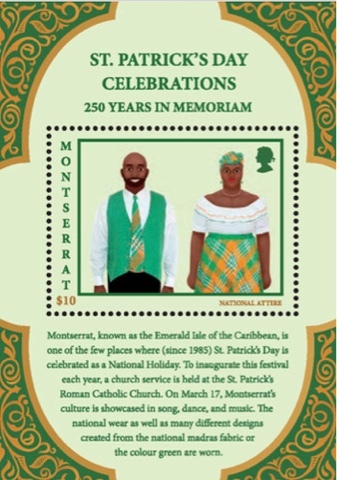 An information sheet on the stamps notes: “Montserrat, known as the Emerald Isle of the Caribbean, is one of the few places where (since 1985) St Patrick’s Day is celebrated as a National Holiday. The day became a national holiday in 1985 due to the discovery that on 17th March 1768 there was an attempted slave uprising on the island against the colonial masters. The holiday serves as memoriam of the insurrection. “Prior to the onset of volcanic activity in 1995, this celebration was concentrated in and around the village of St Patrick’s, which was located in the Southern part of the island. It has now matured into a week-long national festival held in the village of Salem where both Irish and African heritages are celebrated. “To inaugurate the festival each year, a church service is held at the St Patrick’s Roman Catholic Church. On the festival day, (March 17) a parade is held leading to the village which is created to showcase Montserrat’s culture in song, dance, and music. During this time the national wear (dress & suit) as well as many different designs created from the national madras fabric or the color green are worn. Masquerades are on display dancing Quadrille to drum beat and fife music, very picturesque. In addition, traditional foods, such as our National Dish (Goat Water) and Duckna are prepared and sold. Games from yesteryear such as marbles, and zig zag zagget are also played. Lovely stamp issue, but I wish when they are doing a special series of stamps they would use denominations that are in common use locally for mail, so that they would become familiar to those of us who live locally.